When I was a kid, I always wanted to build a tree house. The neighbor kids had one that was a thing of wonder — to me, at least. It was a patchwork of construction site scraps held together by bent nails, clothesline rope and sheer luck. Somehow they’d actually gotten it to stay aloft and I thought it was the coolest thing I’d ever seen. But alas, the dream of building my own tree house was put on hold until about 12 years ago, when my own kids started talking about one. That’s all it took. Once again, I found myself lying awake, planning every detail. Building it was even more fun than thinking about it and over the course of about a month, my childhood dream took shape among the boughs and branches of our backyard’s maple tree. I didn’t want to cause any damage the tree, so the structure stands separate from it, with one large bough ascending through the floor. 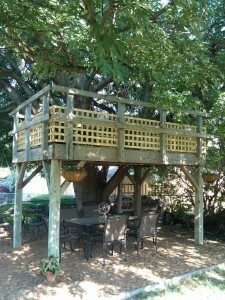 It’s basically an elevated deck, “in” the tree. After all these years, it’s still enjoyed by anyone who can climb its ladder. Thanks to those neighbor kids, wherever they are, for the inspiration. Thanks Stephanie. It's probably about a 50/50 split. My little grandaughters think it's pretty cool. That's cool. Can you still climb the ladder? I remember reading "A Tree Grows In Brooklyn" in my tree house in the Midwest when I was growing up. 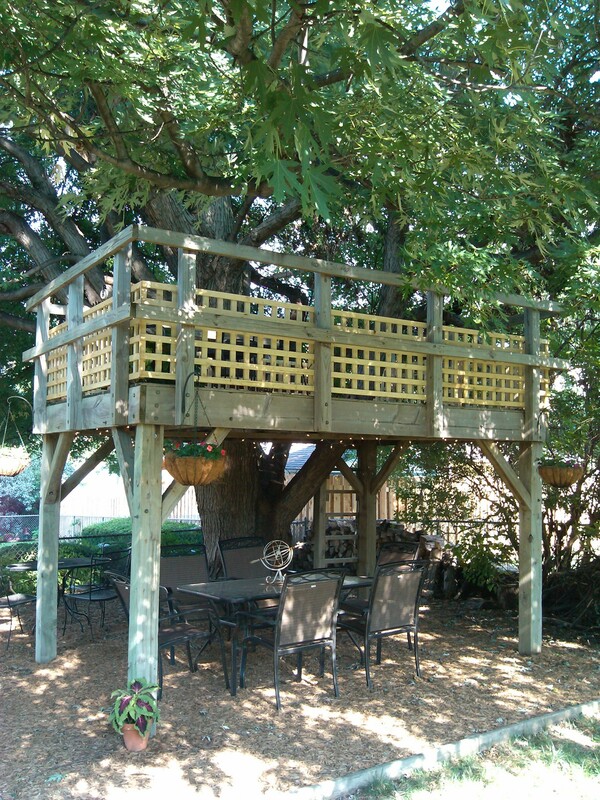 I wish I had that tree house in my backyard right now. Yours looks fantastic. Yes, if a mean dog is chasing me. Thanks Paula. Yes, there's something nice about being up among the birds and branches.